Seatbelts on for Europe’s final Grand Prix of the year this weekend at glorious Monza, one of the few remaining classic circuits on the calendar with an average speed of 155mph and a breathtaking top speed of 210mph for F1 cars. 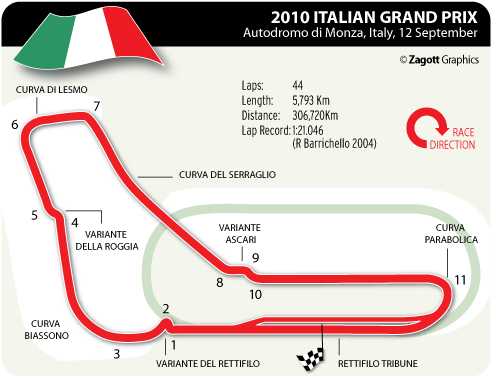 Couple that with the screaming Tifosi creating an unmatched atmosphere, Monza is not a circuit for the faint-hearted. There may also be a few nervous moments for Ferrari and Red Bull before they even take to the track. The Maranello outfit faces a carpeting in Paris from the World Motor Sport Council over the team orders debacle while the Red Bulls will join Ferrari in hoping they pass the new stringent tests on flexible floors in scrutineering prior to the race. Fernando Alonso will be praying that he won’t see points deducted over the Germany result to stretch further the 41-point deficit he has behind leader Lewis Hamilton. After another dreadful afternoon at Spa, he knows that time is running out for his championship campaign – even with 150 points still to play for. What is certain is that if he has a poor showing at Ferrari’s home grand prix, he can forget his chances of a third world title for 2010. Over at rivals Red Bull, damage-limitation is likely to be the guiding theme. After Vettel’s ridiculous behaviour in Belgium, team boss Christian Horner will be hoping his wunderkind can keep out of trouble for once. Mark Webber knows that another good showing over his teammate in Italy will add pressure on Red Bull to start favouring him in the fight for the title, despite their desperation for the German to be the team’s number one. The superfast straights of Monza will expose the Red Bull’s only weakness so Webber knows that if he can bank a high number, points-wise, he will be set fair for the final run-in at the remaining Red Bull-friendly circuits. For McLaren, Monza is the last circuit where their power advantage makes them a favourite. Lewis Hamilton drove like a champion-in-waiting at Spa but he knows he has to score heavily at Monza to give himself a chance to fight for points in the fly-away races. I doubt whether there is anyone better than the young Englishman on the grid at the moment in scrapping for places against superior cars. Teammate Jenson Button, still infuriated by Vettel’s banzai behaviour in Belgium, knows that he has to outscore Hamilton to keep his championship hopes alive. Only he seems to think it likely, though. An outside bet for a good showing at Monza has got to be Robert Kubica. The rapid Pole should have had second place in Spa and now has a Renault that shows real high-speed pace. With their new F-duct working perfectly, Kubica will enjoy terrific speed at Monza and is likely to punch above his weight for the second race in a row. Unfortunately, the same cannot be said of his Russian teammate. Petrov appears to be afflicted with the worst trait for a grand prix driver – unpredictability. He can be amazingly quick one day, boneheadedly stupid the next. At least he is entertaining. The Force Indias are also likely to give a good showing in their seriously under-rated car, especially at high-speed tracks. The performance of the Mercedes is still something of a mystery, a bit like their drivers. The team has the appearance of an outfit that has written off this year’s championship and is concentrating on a decent car for next year. The same can also be said of the Saubers – surely a driver shake-up is needed there after the lacklustre performance in Spa. One of the keenest drivers to get to Monza will be Lotus’s Jarno Trulli who is certain to get warm support from the fans. The Italian driver and his teammate Heikki Kovalainen will be looking to build on their strong performance at Spa to pick up some richly deserved points. This weekend’s result is likely to give us a clearer idea of the contenders for the championship. Whether it’s going to be a straight fight between Webber and Hamilton or if the five-driver battle can continue to keep us on the edge of our seats. It’s hard to believe after Bahrain, but this vintage season keeps getting better and better. Monza should add another captivating chapter.